The Olympia Farmer’s Market opened this week! It’s the first real sign that spring is on its way. I love the first market day of the season. We Olympians are simply giddy with the market atmosphere, and are quite hard-core. We will lazily browse the market taking in the first signs of spring even when the weather is trying to hold on to winter. 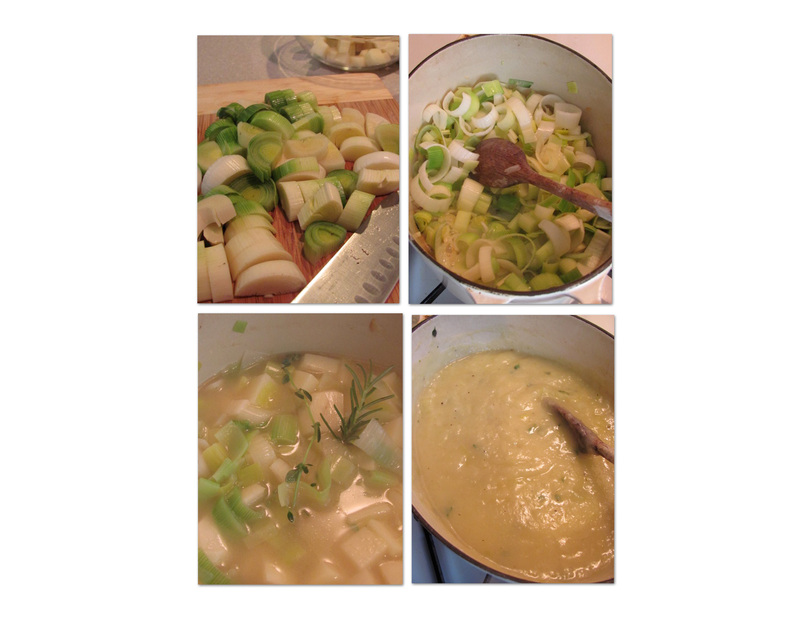 I’m not sure if two years can make something a tradition but last year on market opening weekend I make potato leek soup with fresh leeks and potatoes. I made another version this year. I started with a basic recipe from the now extinct Gourmet Magazine and like most recipes I gave it a bit more oomph. In a large heavy saucepan cook the leeks in the butter with salt and pepper to taste, covered, over moderately low heat, stirring occasionally, for 8 to 10 minutes, until they are softened but not browned. Add the broth, the potatoes and some of the sprigs of thyme and rosemary. Simmer the mixture, covered, for 20 minutes, or until the potatoes are tender. Remove the thyme and rosemary sprigs and in a blender purée most of the soup, stir the purée into the remaining chunky soup. Add some more fresh thyme and rosemary leaves and season the soup with salt and pepper. This entry was posted in Farm-to-Table, Recipe, Soup. Bookmark the permalink.